Certificates are used to validate outbound SSL connections. 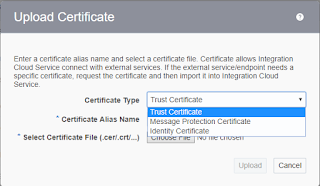 If we make an SSL connection in which the root certificate does not exist in Oracle Integration Cloud Service, an exception is thrown. In such cases, we must upload the appropriate certificate. A certificate enables Oracle Integration Cloud Service to connect with external services. If the external endpoint requires a specific certificate, request the certificate and then upload it into Oracle Integration Cloud Service. 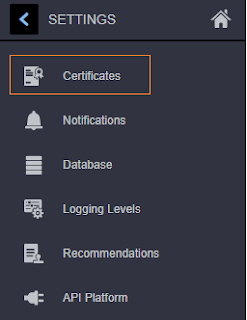 All certificates currently uploaded to the trust store are displayed in the Certificates dialog. In the Upload Certificate dialog box, select the certificate type. Each certificate type enables Oracle Integration Cloud Service to connect with external services. Identity Certificate: Use this option to upload a certificate for two-way SSL communication. Click Browse, then select the keystore file (.jks) to upload. Enter the password of the keystore being imported. Enter the comma-separated list of aliases from the keystore being imported. Enter the comma-separated list of passwords corresponding to key aliases. Select Show Key Password(s) to ensure that the password we entered is correctly entering a list of keystore passwords. Thanks Suba for such nice comment.